EDITOR'S NOTE: The annual Children's Art Exhibit is open to the public during Gallery Walk, April 4, from 5 to 7, at the New England Youth Theatre. Stop by to support the area's young artists whose work is displayed. Bring the whole family for children's activities, refreshments, and information on early childhood services. The room is ready. Grey bumpy paper covers one table. An assortment of soft pastels and charcoal is at hand. The other table is covered in magazines for collage. Two large art books are set out about Hundertwasser and Dubuffet. Coleman Hawkins fills the air with alto sax. Seven excited children arrive with their portfolios and bag lunches for a three-hour art class at 10:00. They welcome this time to come together and make art. 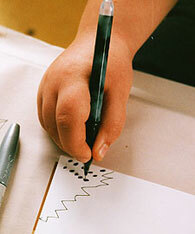 Jack has selected a fine black pen and a large sheet of white paper with a smooth surface. He begins to create a labyrinth of fine scribbles that fill the page. Will it include color? He works on the floor on his tummy. Marjorie works nearby, her sheet of paper holds stylized cartoons of a boy, a girl and a baby. She is ready to add color. Fill the page. Use the whole page. Alexander, at four, is the youngest and he works alone. "A crown, I want to make a crown." He is proud that he has learned to use scissors to cut the zig-zag in the heavy grey paper that will loop back and be joined with staples. He collages the crown with the images he finds in the magazines and adds his own marks to the finished piece. Makenna likes the bright chalky pastels. She uses her whole arm to move the color across the white card stock. Her hands and elbows are covered in the fine dust as she adds and rubs and moves the pigment across the surface learning how the different colors work together. Malick and Keegan are together at the collage table. Making becomes choosing from the many images on the table. Malick chooses a piece of bubble wrap to color and glue onto the paper to create a three-dimensional work. 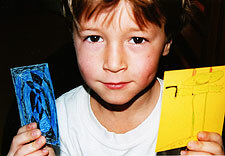 The children push this further, attaching origami-like paper foldings that they name "popouts." The popouts become the surface on which the collaged images are glued. Eliza has listened to the explanation of Richard Diebenkorn's theory that we develop an inner landscape similar to that of our childhood memory. "I was born on Cape Cod, near the ocean!" Her drawing of a circle filled with a tree was made with Prismacolor pencils. She calls it 'Buddha Tree' and populates it with small animals placed on branches. The handling of the pencil, the marks and the openness of the work are all reminiscent of the ocean, and she can make this connection. 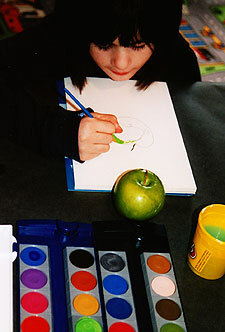 I will write of this connection in the article about children and art, for this is very special that you understand so well. The children are so impressed that an article will be written about them. Their work is exhibited on the wall of the school, and the remainder travels home to show off. "Can we do an art show and sell our work?" They can already describe with ease their process and name the materials they use. They bring to share, things that they love. Twice we have listened to violin music. The empowerment of children through art! I feel blessed to watch it unfold.